With only a week of school under their belts, the children gave us a lovely window into the role contagion can play in first explorations of representation. Over the course of two days, we adults were witness to a flow of ideas from child to child, and from medium to medium that gives us a little window into some impressive thinking. Ella (4 yrs, 8 months) was investigating a bejeweled enclosure that someone else had built on the block platform, when she asked me if we have any horses, “Because I want to play with a horse in the fence.” I offered to help her make a horse for the fence. She said she did not know how to draw a horse, but she was willing to trust me. I talked her through the drawing of this horse, asking, “What does a horse have?” “What shape do you think that would be?” and so on. When she had drawn and cut out the horse, Ella said, “Now I need to make a person to ride the horse.” Again, she accepted support to draw the person. 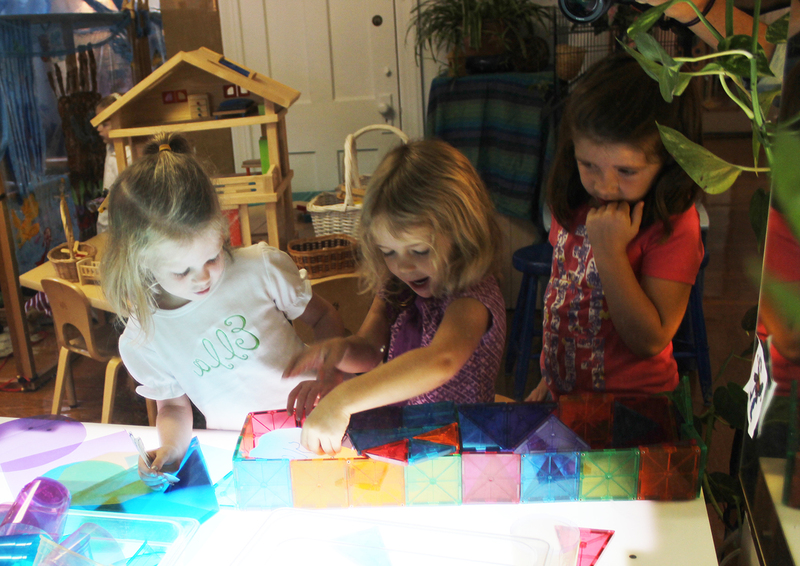 When she was finished, Ella set out to make a house for the horse with Magna Tiles on the light table. To us, this was a sign that Ella had experienced the pleasure of making her ideas visible and was reluctant to end the encounter. Ella works on the house for the horse. Ella’s work at the light table attracted attention (Because it was a more public venue than the drawing table? Because other children could see the use of such a drawing?). Sloane said that she, too, wanted to draw a horse. While Sloane was drawing, Berkeley joined her and also drew a horse. Two friends watch Ella create a horse house. Berkeley recalls as much as she can about how a horse looks (which is considerable); when she gets stuck, a picture of a horse helps her proceed. In this picture, Sloane, age 4 yrs, 2 months, sitting across the table from Berkeley, is using the picture as a referent. Wondering if others might be similarly inspired by Ella’s, Sloane’s and Berkeley’s project, I invited them to show their work to everyone at meeting. Then we engaged in some “Shared Drawing,” a collaborative protocol in which the children decide what to draw, and then they direct me (or someone else) in drawing it on the white board. In this way, because they have to put their thoughts into words, the children think through the process more deliberately than they tend to when they are wielding the pen. And their thought process benefits from hearing the perspective of the others. We drew a cat together, and then I waited to see what would happen during Projects And Play. Hailey (age 5 yrs, 4 mos) caught the idea and changed it a bit, declaring intent to draw a cow. Again, she talked herself through most of the drawing (in answer to my questions), and she used a few pictures available in the classroom to answer her questions about whether cows have eyelashes, how their noses look, and so on (first research). Extrapolating further, Hailey then set out to draw a chicken, using the same protocol, thinking through what chickens have aloud with an adult and using images when words were not enough. When she had drawn the chicken, she drew a baby chick. And then she drew two eggs. In this way, she represented (for herself) and demonstrated (for us) her understanding of the life cycle of chickens, of relative size, and of the relationship between horse, cow, and chicken. Not in words, but in her own equally powerful, graphic language. Hailey uses a picture on the iPad as a referent to draw a chicken. Her cow picture sits to her right. 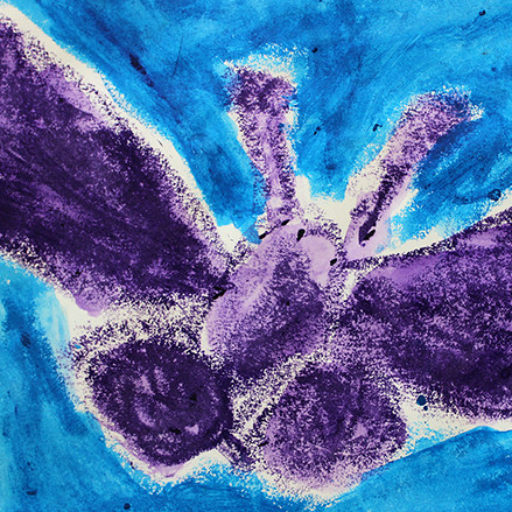 However, when Hailey clarified that she only wanted to paint a portrait of Ella, not actually paint her skin, Ella agreed. 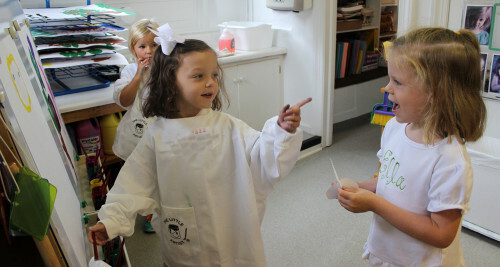 Ella stood (and later sat) for two sessions of painting, in which the girls investigated Ella’s eye color, the color of her clothes, her hair color, and so on. Noticing that Ella’s hair is blonde, Hailey started with a yellow head. Later, Ella helped Hailey notice parts she had missed (like her arms!) and copy the cursive “Ella” written on Ella’s shirt. Discussing Ella’s eyes. Note Alice watching intently. I now wonder if Alice will pick up on Hailey’s idea. Ella helps Hailey with the name on her shirt. Ella knew that her name is spelled E-L-L-A, and Hailey knew what L’s should look like, but the cursive L’s on the shirt did not meet Hailey’s expectations, leading to a brief moment of disequilibrium. Ella holds her arms out so that Hailey can paint arms on the portrait.